Downtown Juneau is as quiet as a forest pond this Sunday morning. The tourist shops closed when the last cruise ship headed south last month. Aki and I walk along the edge of the Starr Hill neighborhood where three mainstream churches stand. We pass the Catholic Cathedral first, the smallest in America. The faint sounds of chanted responses leaks through its 100 year old walls. Down the street, the Episcopal priest preaches on today’s Gospel, reminds his congregation that what they do for the least of God’s people, they do for Him. While I stop to look at the priest in his heavy medieval robes, Aki squats at if to pee. I drag her away before she can spot the sidewalk with her message. Down on Front Street a congregation of European football fans (“Soccer” in American) watches a match on the Viking Bar’s giant screen TV. 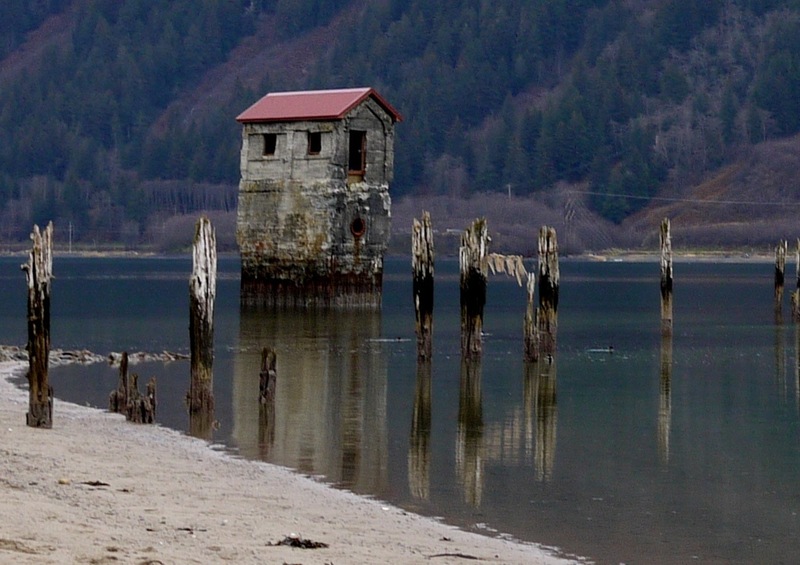 Their cheers mingle with the screams of gulls fighting for scraps floating on the surface of Gastineau Channel. Startled by the cheers, Aki growls a warning. 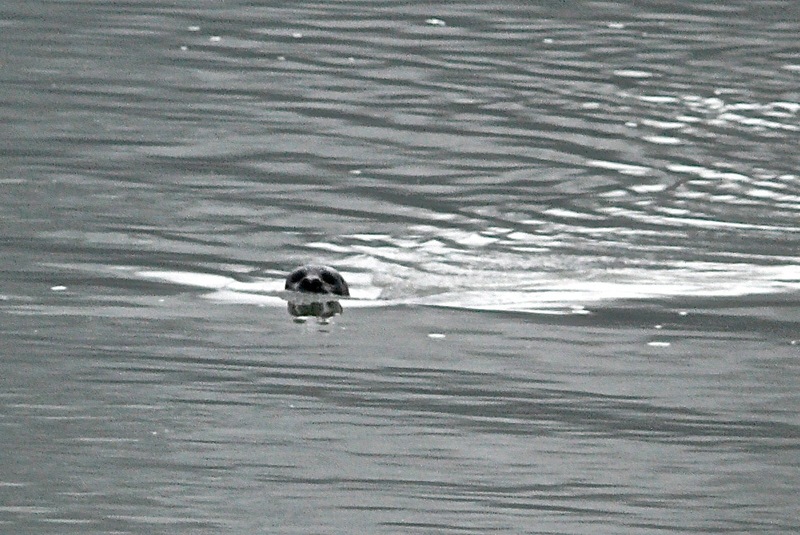 All this eavesdropping makes me think of the seal we saw yesterday near the Outer Point Beach. He was face down on the surface when we broke out of the woods. We must have startled him because he slipped quickly underwater and then raised his head up to stare at the dog in a fleece coat and her human companion. As I do every time the dog and I are the target of a seal stare, I wonder what the animal makes of us. The seal is sadness, itself. You find the same look on children watching a game from which they are excluded—the look of an exile. I don’t find a similar look on Aki. She, who would not be welcome in church or bar this morning, just ignores the congregations. 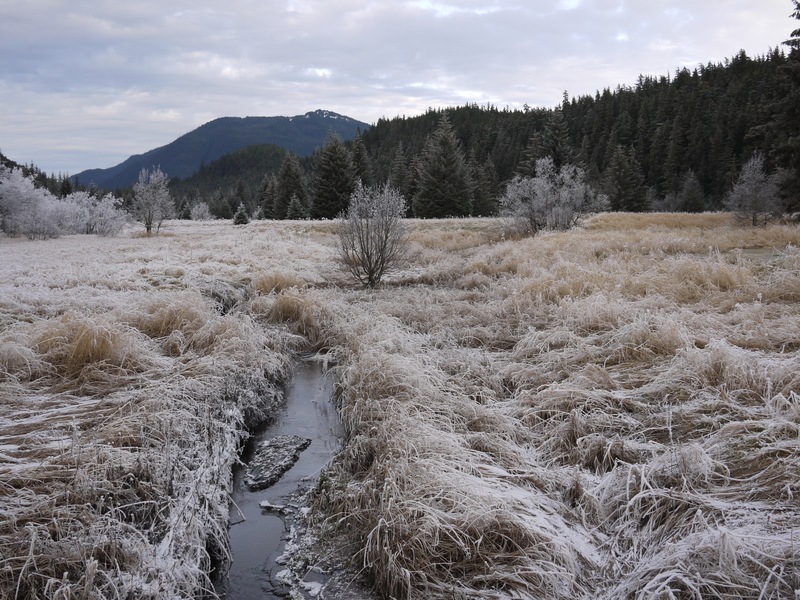 This entry was posted in Aki, Dan Branch, Juneau, Nature, Southeast Alaska on November 23, 2014 by Dan Branch. Aki and I are at the one place near Juneau where ice still covers water after the thaw: the glacial moraine. It’s where winter come first and leaves last. It’s where we ski and skate and do a lot of starring at the river of ice. I’m starring at it now. This morning’s heavy overcast has weakened to let shafts of sun strike the flank of Mr. McGinnis. 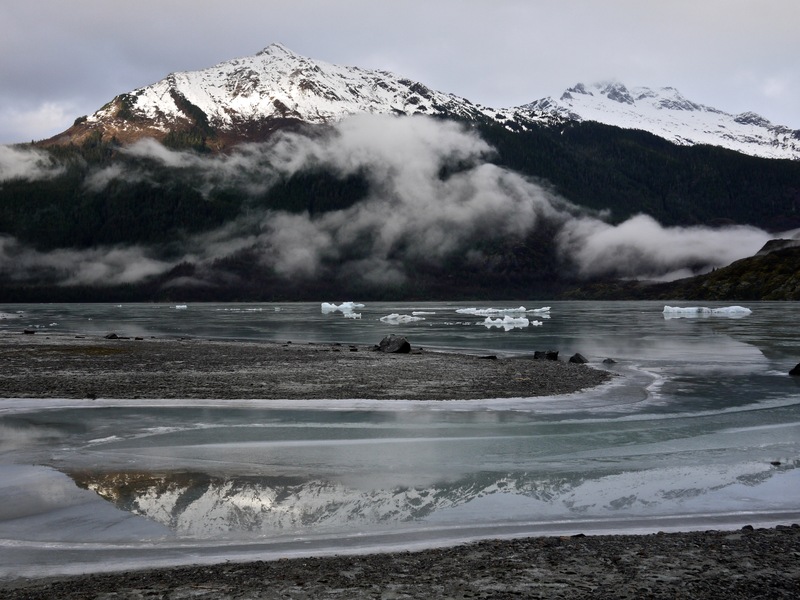 New ice on the lake mirrors the image of the illuminated spots of forest, the moving mists below them, the pale blue glacier ice, sharp peaks of McGinnis, and the Mendenhall Towers. 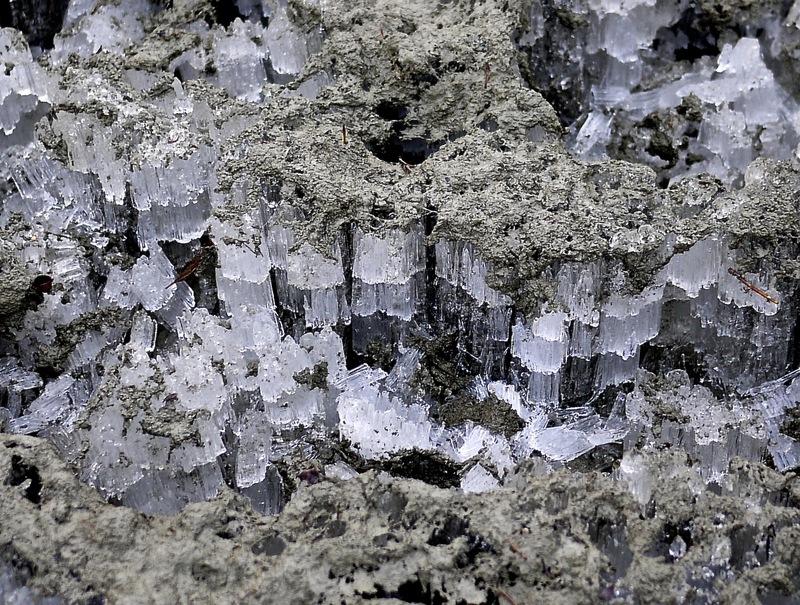 Has rock and H20 in its three phases of ice, vapor and water made art? 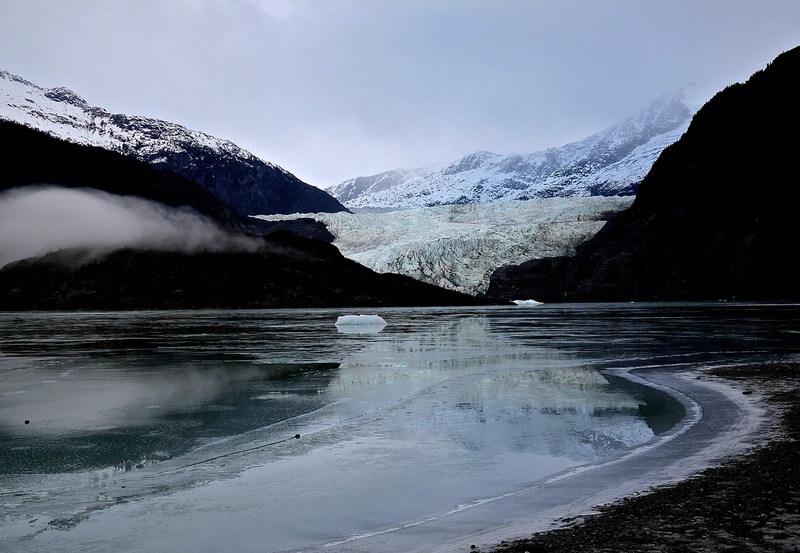 Or does it require a photographer like Juneau’s Mark Kelly to elevate these images? I image Aki and I as anthropologists drawn here by reports that members of the mineral community produce their own art. After cataloguing the glacier and mountains reflections on lake ice, we cross a mud bar to reach the moraine. 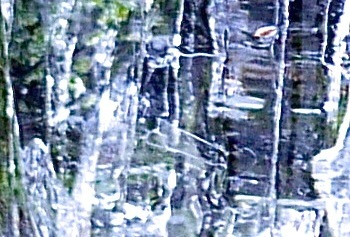 Aki sniffs out a grotto of ice pillars, half clear as glass, half an opaque gray. They support a roof of glacial silt mud, “Clearly Aki an intelligent mind is at work here.” The little dog, a more detached observer than I, pees and walks over another section of ice supported mud that collapses under her weight. “Quite right, Aki. It just chemistry, not our field; more a matter of molecular bonding.” It’s still beautifully placed crystal that I’d be proud to capture in a decent photograph. 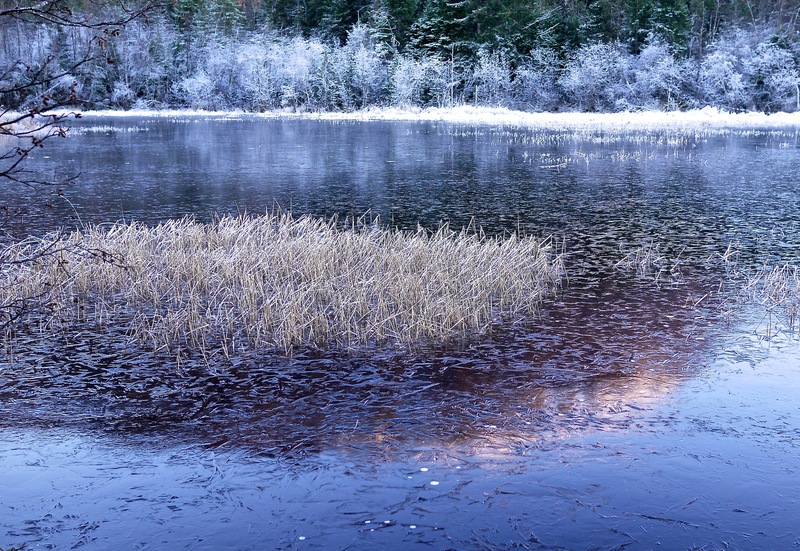 This entry was posted in Aki, Dan Branch, Juneau, Nature, Southeast Alaska on November 21, 2014 by Dan Branch. Dry clouds have descended on Chicken Ridge, giving the air and sky a visual neutrality that inspires contemplation rather than awe. At least that is how the opaque cover affects me. Aki only reacts to smells and my voice. We pass the colorful craftsmen houses on Basin Road and I notice, for the first time, that someone has painted her access stairs the brightest purple. Not even the cloud’s grey blanket can diminish its strength. Is that why it is a royal color? Once over the old trestle bridge, only the green of some stubborn ferns and mosses stand out in the glom. Almost hidden in a moss-covered niche, we do find two wedges of ice. 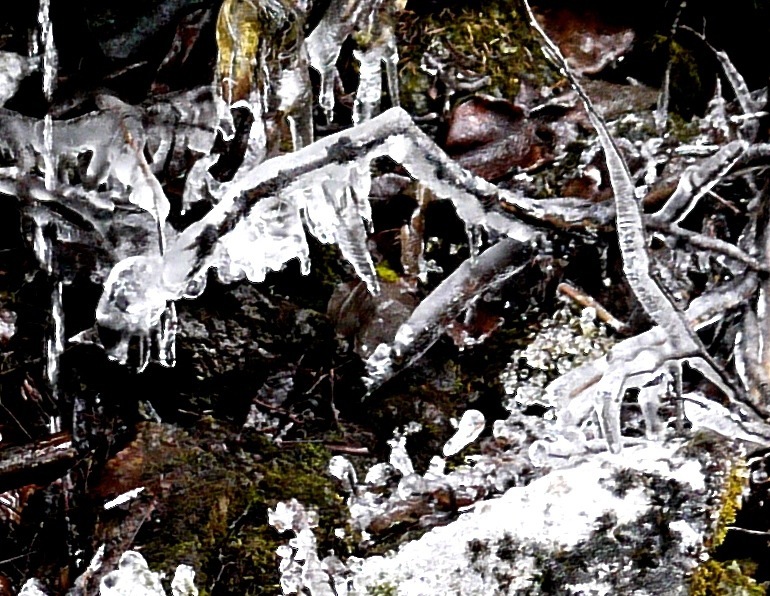 They are all that remains of the ice and frost formed during our first cold snap. Melt water varnishes the ice with a jewel like luster. I think of Néle Azevedo’s minimum monuments. With molds and vast freezer space, the Brazilian installation artist creates thousands of ice sculpts of people. Hundreds or even thousands of volunteers help her install them in a public area where they melt to water. 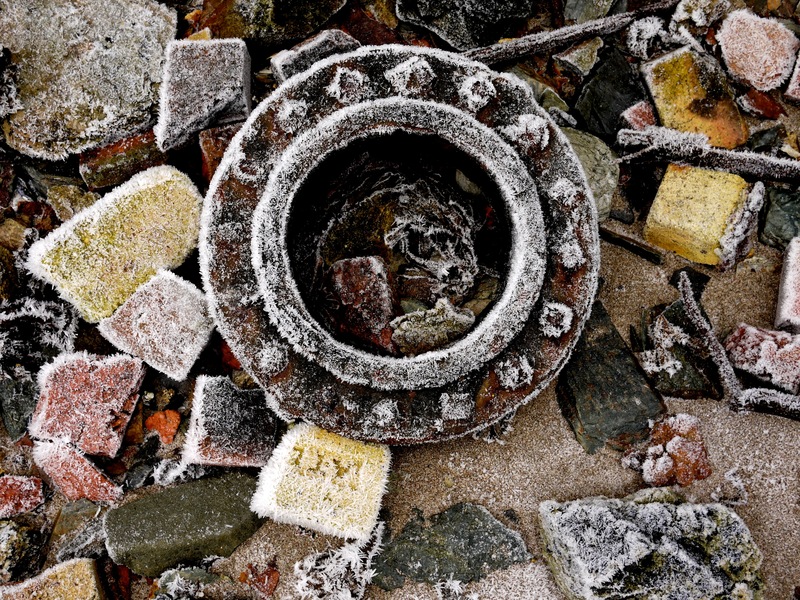 (“Made to Disappear,” Sculpture Review, Fall 14 Vol. IXIII No. 3). In Birmingham, England, one of her installations inspired reflection on the human loss during the First World War. In other places they reminded people of the risks people face from global warming. Normally I don’t get installation artists but Ms. Azevedo’s work excites. Like Elizabeth Kübler Ross, I want to accept the inevitability of death so I can appreciate life. What better learning tool than one of Azevedo’s minimal monuments. The volunteers who help placed the ice people watch the installation, first with the pride of ownership, then as the sculpted nudes begin shinning with melt water, the excitement produced by beauty. Soon exhausted by those emotions, they relax into acceptance and then relief when all that’s left is water. Then they can reflect on predictable loss. 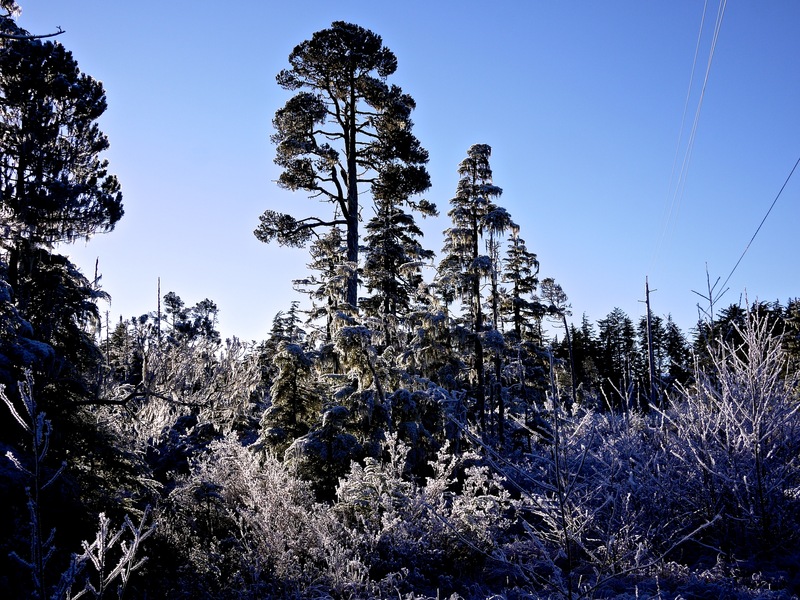 This entry was posted in Aki, Dan Branch, Juneau, Nature, Southeast Alaska on November 20, 2014 by Dan Branch. It’s Aki’s birthday so I take her to the Treadwell ruins, a place frequented by many dogs. A light rain fell on the car when we drove here but it has stopped. Most of the frost and ice melted as the temperature rose last night, revealing some still-green leaves growing close to the ground. Aki smells and pees without canine company until we reach the beach and find a young couple kissing while a Chihuahua and Labrador circle them. With the dogs playing in the sand and the Juneau waterfront in the background, they could be posing for a travel poster—Come to Juneau, a town loved by lovers and dogs. Aki charges down the beach to the dogs, startling the lovers out of their almost chaste embrace. While she dashes around with the Chihuahua, I trace a line of relic wooden pilings out to a rectangular sided tower rising out of the channel. It could be the top of a submerged battlement but I know it is just the old air intake tower for the Treadwell mine. A mature bald eagle, head and tail the color of snow on Mt. Juneau, flies down channel a few feet off the water. Recognizing danger, three mallards burst off the water before the eagle can sink his talons into one of them. Usually eagles hunt by soaring over prey and then diving on them. One dove on Aki when she was a puppy. She had run down a different beach to play with a dog too far away for me to protect her. The eagle glided to a point several hundred feet above the little dog, circled and plummeted, talons forced forward like bayonets. Aki scampered into the woods before the eagle stuck. The smell of cooking hot dogs, not fear of danger saved her life. Maybe we should have hot dogs for dinner to celebrate her birthday. 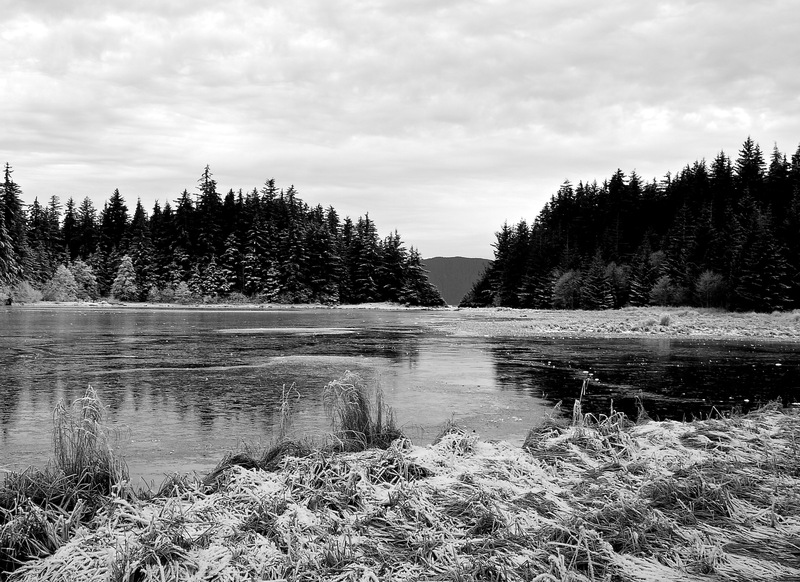 This entry was posted in Aki, Dan Branch, Juneau, Nature, Southeast Alaska on November 17, 2014 by Dan Branch. This morning we drive out the road, passing through Juneau and by its glacier. 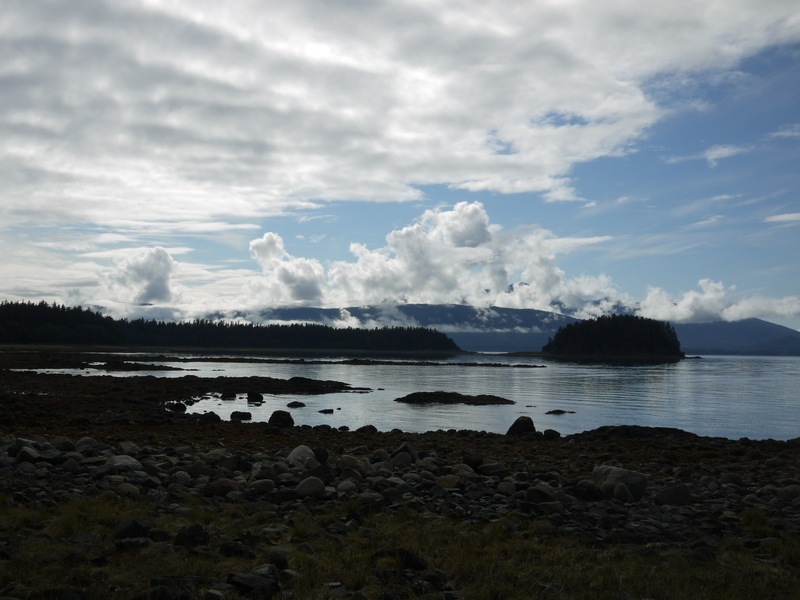 We move beyond Auk Bay, the Alaska Marine Highway Terminal, Lena Cove, Tee Harbor, and The Shrine of St Teresa. Aki whines and squirms a bit each time we fail to stop of one of the trailheads along the way. She becomes almost pathetic when I slow to take the gravel road toward Amalga Meadows. The hysterics end when we move onto a little meadow covered with tall blades of died-back grass bent toward the ground by frost. Last night North Lights filled the sky and frost feathers thickened into dense crystalline rods. The latter rise up from the glass blades and radiate out from the otherwise naked willow branches. With her short legs, Aki has to perform a series of foot high leaps to move across the meadow. 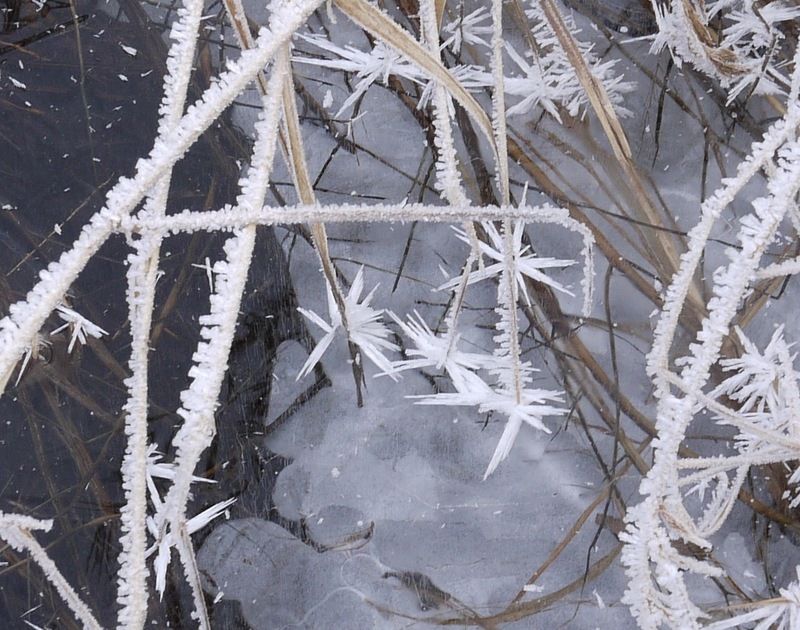 Each leap knocks loose a cascade of frost crystals that sounds like the warning of a rattlesnake. I have to stop several times for her to catch up. After crossing an ice-covered slough, we follow a series of otter trails up and over a forested hill. Now the little dog has the advantage. Like the short-legged otters, she can slip under fallen trees and barriers of devil’s club and blue berry bushes. She scampers while I struggle but is polite enough to wait for me at the bottom of the hill. Our roles reverse again when we drop onto another meadow. This times she walks in my wake. I break trail through knee-deep grass, sending frost rods flying with every step. Anyone could trace our progress by the strip of dead-tan grass we leave in our wake. We destroy beauty by simply moving through the country. I tell myself that it is silly to worry about it; that man’s presence always transforms. The key is to keep down the damage. Unless the wind and temperature rise tonight, more frost will form to cover our tracks. We are heading for the waterfall that releases water from the slough pond into salt water when a shotgun blast sounds. Aki cringes a little and oddly enough, so do I. She gives me her “why can’t you read my mind” look. “Well little dog, has my kind done enough damage for the day?” She doesn’t answer. Hey, she is just a dog. But she does break back down the brown trail we made through the grass. 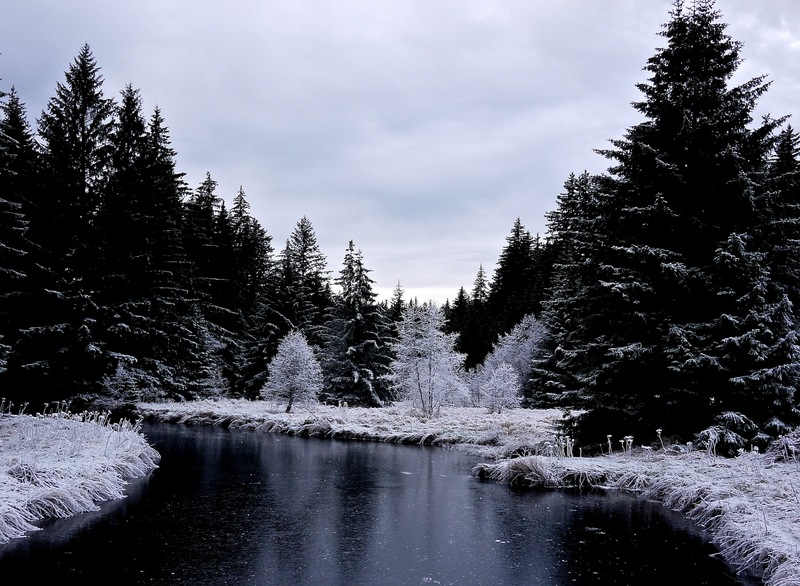 This entry was posted in Aki, Dan Branch, Juneau, Kwethluk, Nature, Southeast Alaska on November 16, 2014 by Dan Branch. Aki and I came to this trail at the end of the North Douglas Highway because it is cold and sunny, and the lack of wind last night has allowed frost feathers to form on the trailside plants. 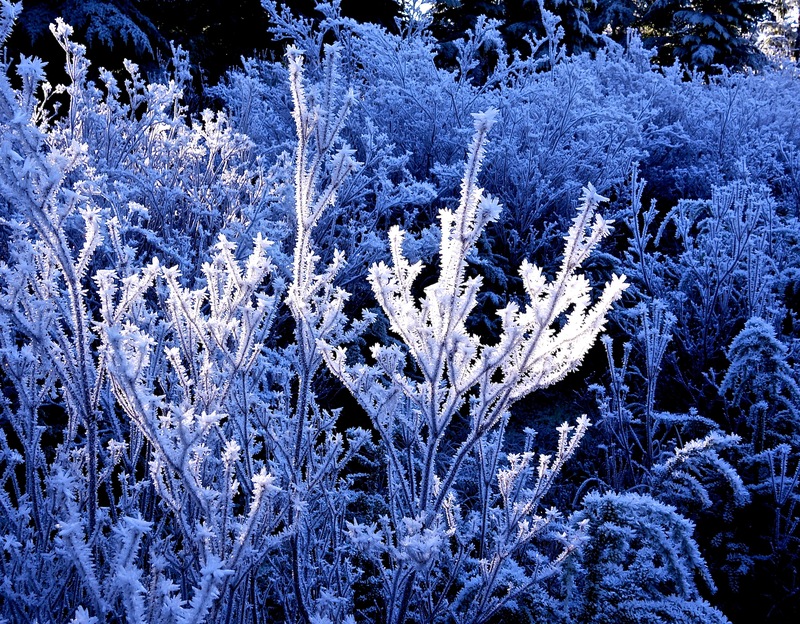 We arrived now because the morning sun always brings our beauty in frost feathers. 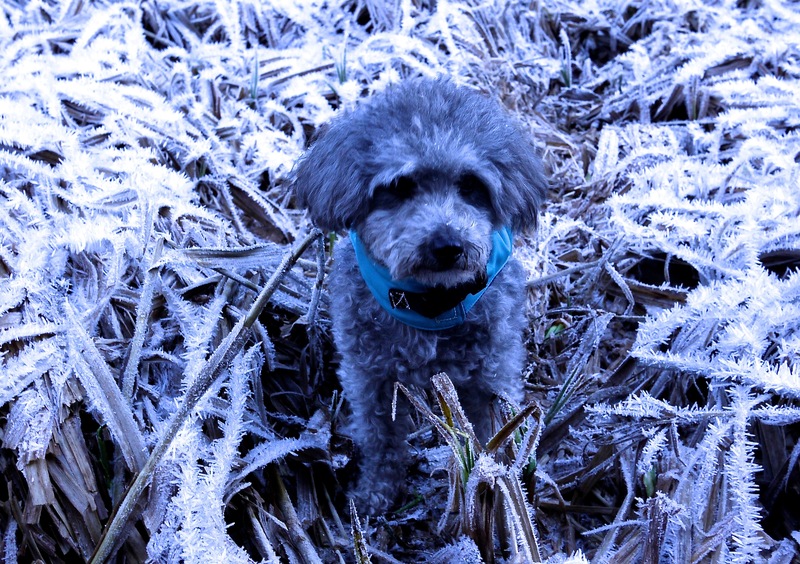 In truth Aki, the miniature poodle mix cares little for visual beauty. The strong sun hurts her eyes. But she has a ball charging up and down the boardwalk trail, sounding like a galloping horse. 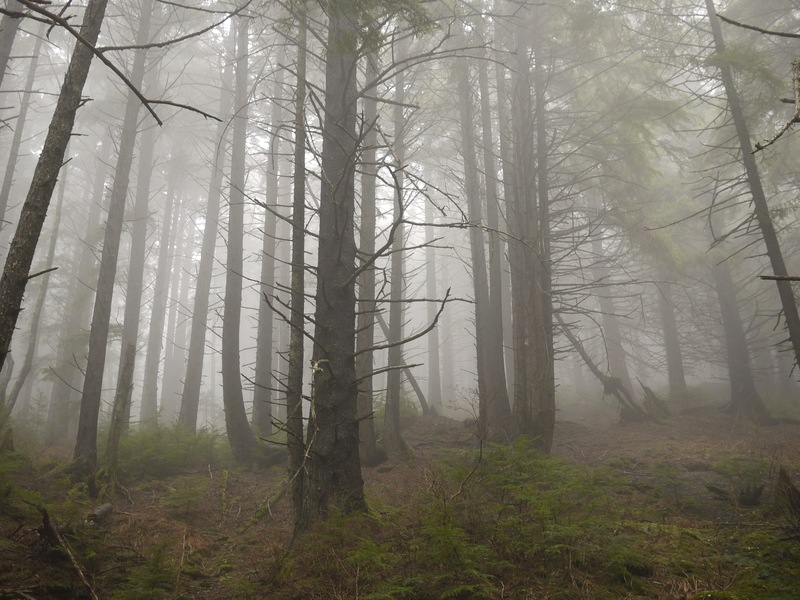 The below freezing weather has firmed up a normally muddy trail along Peterson Creek, which leads out of the frost ferry land and into a solemn mixed alder and hemlock forest. No ice covers the creek so it reflects the grey and white trunks of alders that lean for sunlight over the water. 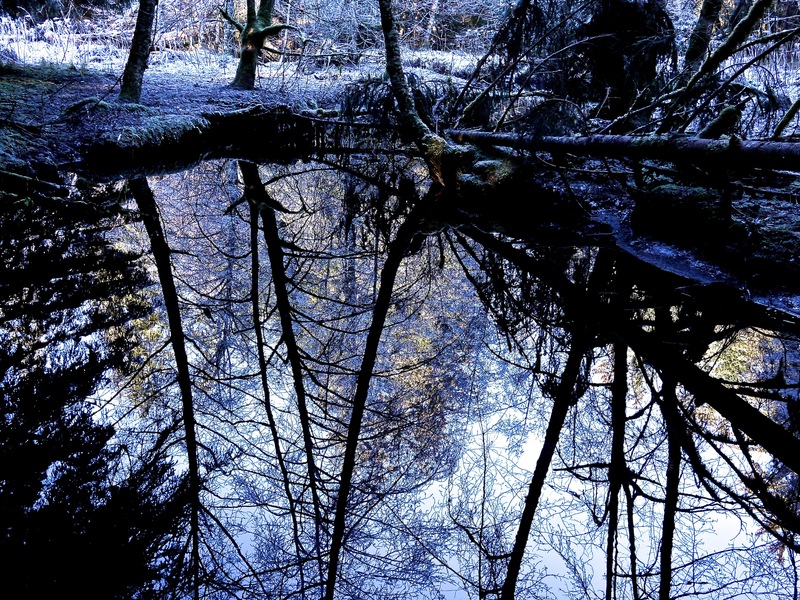 I crunch over fat bladed grass, drained of all color but winter tan, covered with frost yet to be lit by the sun, to the edge of an oxbow bend where the dark shadows of alders crisscross the reflection of a bright winter sky. It feels a holy place, a sanctuary. Like a dark corner of Chartres Cathedral, I can stand in this calm world of grey and search the shadows for beautiful shapes, carved by God, not man; see the colors of redemption shine through the prisms of frost feathers, not stained glass. 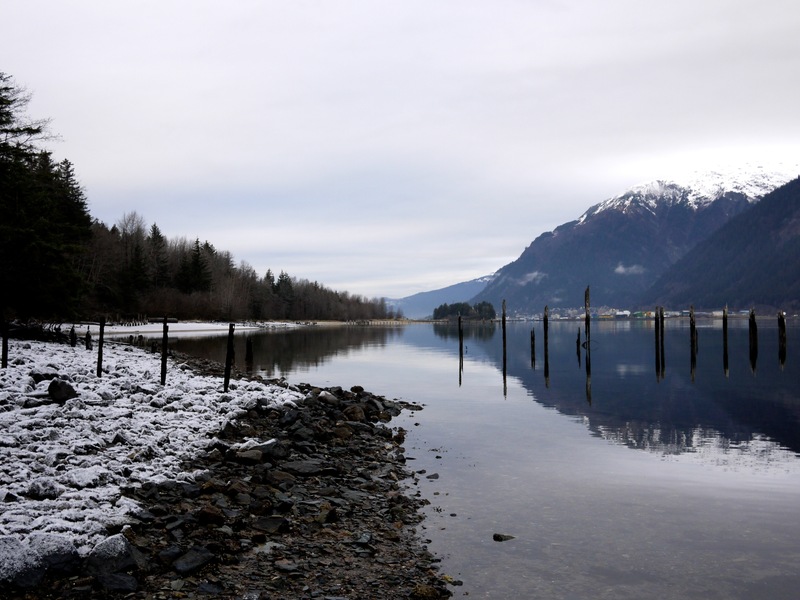 This entry was posted in Aki, Dan Branch, Juneau, Nature, Poodle, solitude, Southeast Alaska on November 15, 2014 by Dan Branch. It is hard to know whether to look up or down. 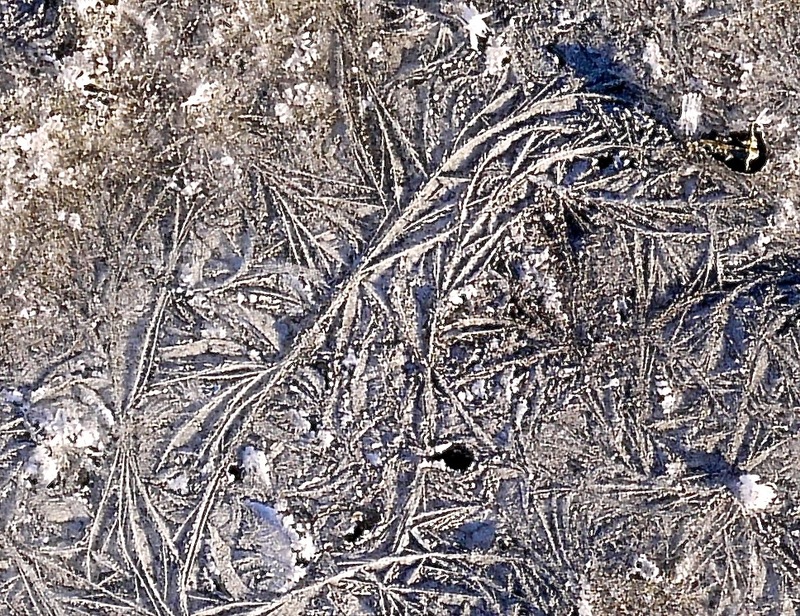 Our first cold snap has crisped up the trail, freezing up the muddy bits and decorating sand bars with frost feathers. Most of the moraine lakes are completely covered by a thin sheet of opaque ice that just manages to catch the mountains’ reflections. So while Aki sniffs and pees I look down at the frost and up at the white covered mountains looking spiffy in the late afternoon sun. There still be some open water because we hear a shotgun fired nearby. Somebody is taking one last shot at the ducks before they move out to salt water. I think I heard the hunter’s comic sounding duck call when we circled one of the lakes. Without the hunter, we would have silence. Even the squirrels are mum. Maybe that is what I like the best about winter weather. We usually have silence, especially during heavy snow to go with the beauty. 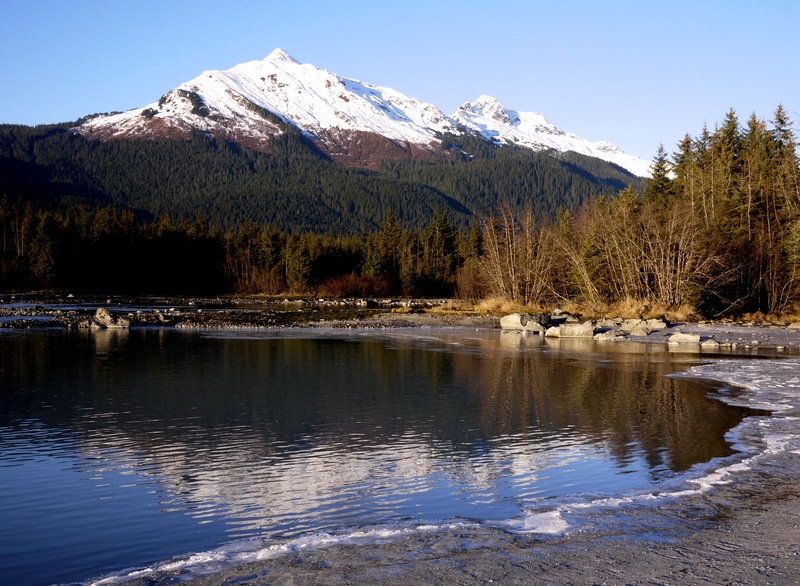 This entry was posted in Aki, Dan Branch, glacier moraine, Juneau, Nature, solitude, Southeast Alaska on November 13, 2014 by Dan Branch.